An Oasis spreader plate provides a convenient means of mounting more than one box on a single post. This is ideal for multi-unit applications or where postal requirements dictate centralized delivery. 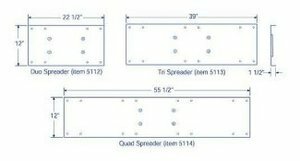 The spreader plates come in three sizes - for mounting two, three or four boxes.